Since the city’s founding nearly 200 years ago, Chicago has been at the forefront of architectural dynamism and originality in the United States. Home to the world’s first skyscraper, the Windy City boasts a stunning skyline and enough fascinating architectural landmarks to keep visitors and locals inspired for years to come. Here’s a look at Chicago’s history as seen through its architecture, with a focus on some of its most iconic buildings. Chicago has come a long way since its founding as a settlement, and then a city, in the 1830s. To visitors taking a car service into town from the airport today, the city is a sprawling, modern metropolis—but it hasn’t always been so large and impressive. Chicago’s population and geographical area were relatively small for the first few decades of its existence, back before railroads made the city more accessible to newcomers, goods, and limitless business opportunities. Manufacturing, banking, and culture soon flourished, and new public parks and a pioneering sewage system confirmed Chicago’s status as a city on the rise. While Chicago’s tightly concentrated commercial district nudged the city to new architectural heights in the late 1800s, it was the dramatic fire of 1871 that set the stage for the city we know today. Hundreds of people died in the blaze, and around 100,000 more were left homeless, sparking a need for fresh building designs, new street layouts, and more practical approaches to construction materials and techniques. In fact, only a handful of buildings survived the fire, with the most famous being the Old Water Tower at Magnificent Mile. Elevators designed by Elisha Otis and tough, low-cost new steel-making techniques greatly influenced post-fire architecture in Chicago. Billed as the world’s first skyscraper, the Home Insurance Company building was completed in 1884, and many more followed in the ensuing decades. Skyscrapers and other corporate architecture in the Windy City began following William Le Baron Jenney’s “Chicago School” philosophy that “form forever follows function,” and low-rise, open-plan “Prairie”-style homes started appearing in the city’s suburbs. Throughout the 20th century, the Chicago skyline rapidly grew into what it is today. 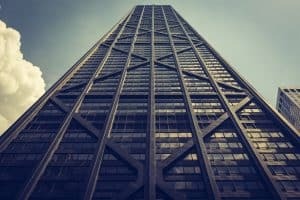 Perhaps the city’s most iconic building is the 108-story Willis Tower (formerly known as the Sears Tower), which was built in 1974 and stood as the world’s tallest building, remaining so for 25 years. Other notable skyscrapers from the era are the John Hancock Center and the twin Marina City towers. And it’s not just tall buildings that make Chicago’s architecture vibrant and unique on the world stage. The city’s cultural and artistic heritage has inspired a number of post-modern, more eclectic structures. These include the McCormick Tribune Campus Center, a squat, stainless-steel complex accented with colored glass and intersecting planes; the modern wing of the Art Institute of Chicago, a beauty made of glass and white limestone; and the sprawling Millennium Park area, home to Anish Kapoor’s “bean” statue, Cloud Gate. Also, construction is expected to start later this year on the Barack Obama Presidential Library on Chicago’s South Side in Jackson Park. Unlike other Presidential Libraries, this will be a fully digitized library. Echo Limousine offers the best ways to ride around Chicago in comfort and style, all while taking in the Windy City’s breathtaking architecture. To book a car service with Echo, get in touch online or call or text (773) 774-1074.